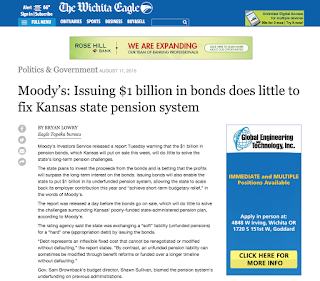 Three recent events provide further evidence that Kansas is just scraping by financially. July general fund revenue was below expectations, the governor cut $63 million out of the current budget, and the state’s pension bonds received a low rating. July revenue fell $4 million below expectations. While $4 million does not represent a huge drop, the July loss is part of a long string of disappointing monthly revenue reports, and a trend that will likely continue. Individual income tax receipts tell the story. Dramatic income tax policy changes began to take effect in 2013, causing a sharp revenue decline, and now income tax receipts are staying down at that low level. Lawmakers raised the sales tax to try to make up for the diminished income tax stream. However, they have also depended heavily on transfers from the highway fund and other funds, leaving a structural budget imbalance in which ongoing expenses are still much higher than ongoing revenue. The expenditure cuts announced by the governor were part of the final FY 2016 (July 1, 2015 to June 30, 2016) budget deal passed by the Legislature in June. To keep the general fund solvent, at least another $50 million had to be cut from the already conservative FY 2016 budget. The governor’s cuts transferred more money from the highway fund, and grabbed federal money that could have been used for children’s health programs. For the most part, the cuts were one-time transactions to save some general fund money in the current fiscal year but do not alter the longer-term imbalance between revenue and expenditures. In the 2015 record-long legislative session, lawmakers faced a budget crisis with general fund expenditures almost $800 million above revenue. They raised sales and cigarette taxes and dropped spending to a low level. That averted a full-blown financial disaster, but did not solve the state’s financial problems or put Kansas on a stable, forward-looking fiscal path. 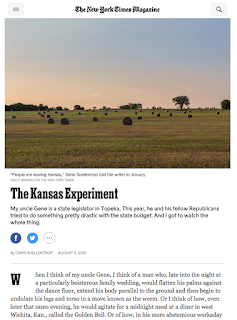 Rather Kansas has been left to live month-by-month scraping by with few reserves, a cramped budget, and little hope that the situation can improve in the future. The root of Kansas’ financial problems is an unfair and unsustainable income tax policy that has garnered too few resources to adequately cover expenses. Lawmakers must reconsider that policy to get Kansas back to financial health.